All transactions are safe and secure with a reliable history in online purchasing behind each of our associates. 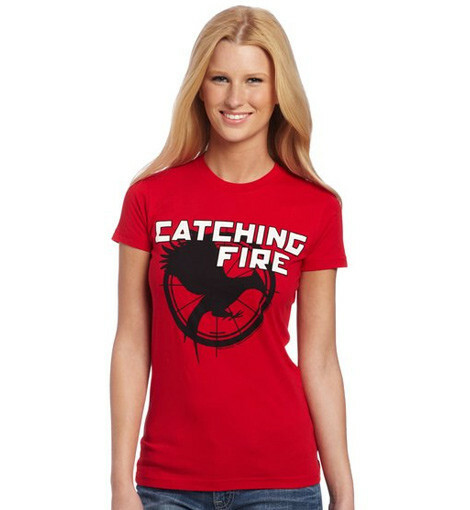 Buy the Catching Fire Logo t-shirt to own Hunger Games clothing and merchandise. If you're on the hunt for a Catching Fire t-shirt, this red bestseller will have you cheering on Katniss Everdeen and Peeta Mellark in the 75th Hunger Games. Not only do these two have lengthy battle experience, they have put their lives on the line not only for each other, but also for their fellow tributes, their families and the suppressed society as a whole. They are the epitome of trust, honesty and loyalty, which is far more than can be said for most of the candidates. These Hunger Games t-shirts show your support. In addition to the Catching Fire Logo tee above, browse the Hunger Games Clothing Gallery for more apparel like men's and women's clothes, kids shirts or hoodies.